If you get reels and combos pre-spooled with quality monofilament line, it becomes much easier and quicker for you to get on the water. The monofilament should be in weights that are right for both size of the reel and the kind of fish you are most likely to target. Here are a few useful tips to ensure the line flows from the reel as you want it to without tangling and retrieves smoothly when you make your first casts. Monofilament nylon line tends to develop “memory”. This means that when line has been wound around a spool, it will retain some loops. However, with some tricks you can lessen this tendency so that the line behaves better. After you tie your bait or lure, let the line play out around 40-50 feet in the water. Now reel in the line back slowly while applying tension by squeezing the line between your fingers while it’s re-entering the reel. This ‘wets’ the line enabling it to turn more flexible and putting tension in the line also helps straighten the loops. Keep in mind that your initial few casts will help the line to ‘relax’ and the line will flow from the reel more and more easily as you make more casts. Setting the drag appropriately will save you from losing that dream fish. The drag offers resistance while reeling in a fish. Never set the drag too much; you need to keep a bit play in the drag to avoid breakage of line when a fish fights hard. It’s recommended to fill the spool to 90%. 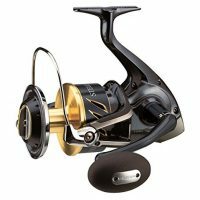 Find the best reels of all kinds on World Fishing Reels and fill the line according to the type of reel. For example, too much line on a baitcast reel can heighten the risk of backlash, while not having adequate line could restrict the casting distance as well as the fish-fighting action. On the other hand, spinning reels require you to fill the spool till at least 1/8th inch of space is left from the line to the spool lip’s edge. This will enable you to use the maximum line capacity without making line to spring off the spool and make tangles. The 1/8th inch rule is also true for spincast reels, although you need to remove the front cover to check the amount of line on the spool. Follow these tips to use your reel and line smoothly and make your fishing trip an amazing experience.